In May of this year, a consortium of California state government organizations teamed-up to release a draft “California Sustainable Freight Action Plan” (“Draft Plan”). The Draft Plan was initiated by Executive Order B-32-15, issued by Governor Brown 16 July 2015, with the goal to increase efficiency and reduce environmental pollution. TransportiCA submitted public comments on the draft plan, expressing our concern regarding: no concrete definition or objective understanding of what is sustainable freight, the draft plan being too short for a major policy document–especially given California’s dominance in national freight, as well as, the need for an economic analysis accompanying the plan, given the amount of misinformation on record, and even dramatized by the Legislature. TransportiCA is curious, first and foremost, what was the interagency partner’s source for the word “comprehensive?” Totaling 23 pages of substantive material, some of the appendices, associated white papers and respective discussion documents dwarf the final plan in size and content; some even hundreds of pages, compared to the final plan. Further, for the nation’s largest freight system, the final plan does not contain too many discrete deliverables for accomplishment, other than general percentages, not backed by current figures for comparison. Lastly, borne of an Executive Order, the final plan lacks the longevity and authority that would be instilled by statutory mandate. 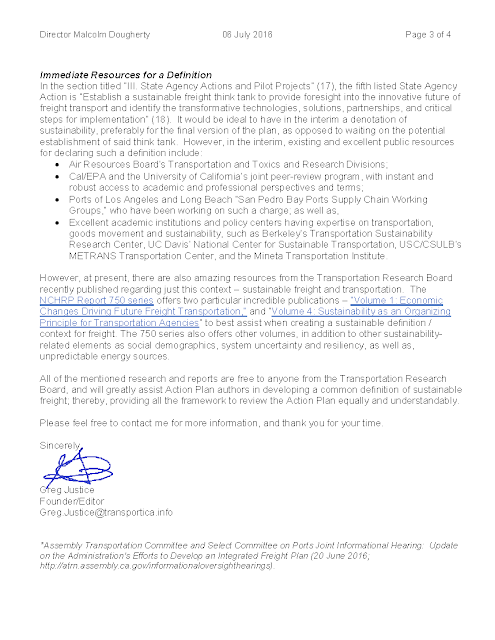 Upon reviewing the final California Sustainable Freight Action Plan, TransportiCA’s editorial board finds the final plan to be anything, but sustainable. What the hell is sustainable freight? While the final plan mentions the words “sustainable freight transport system” ten times, nowhere at all is a formal definition listed of what a sustainable freight transport system is. In section I-B (page 8), one finds a “Vision for a Sustainable Freight Transport System” (pictured below). Although the Vision Statement provides a path to obtaining what can be a system, this still falls short of an objective definition. A vision statement is long-term in nature, stating what achievement(s) are to be desired in time; a definition exudes immediacy, providing a real-time understanding of the concept in question. 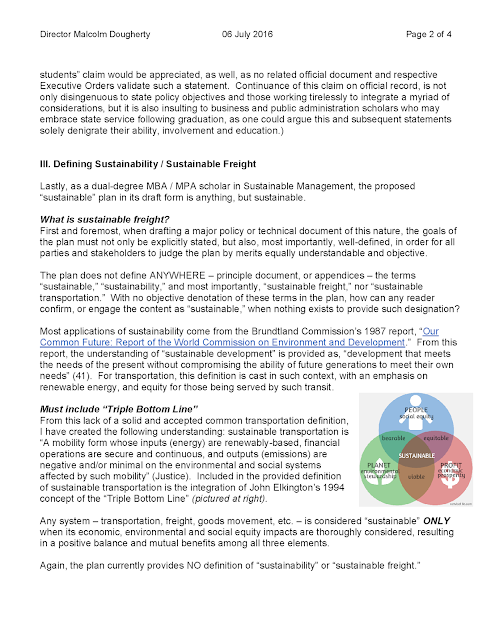 Without a definitive structure of what sustainable freight, sustainable transportation or a “sustainable freight transport system” is, the ability for all stakeholders to examine the proposed system’s “sustainability” is not-existent; such claims cannot currently be found as having merit, with one have nothing to base the claim. In the event where we do not have a uniform and understood framework for sustainability’s examination, we find ourselves delving into the realm of green-washing, driven by socially-correct lip service, financial interests and flagrantly disavowing established public good, ultimately kicking the sustainability can down the road. TransportiCA is glad the three E’s of sustainability are mentioned in the document. However, it is done so only once, which to us, foreshadows the nature of the final plan. 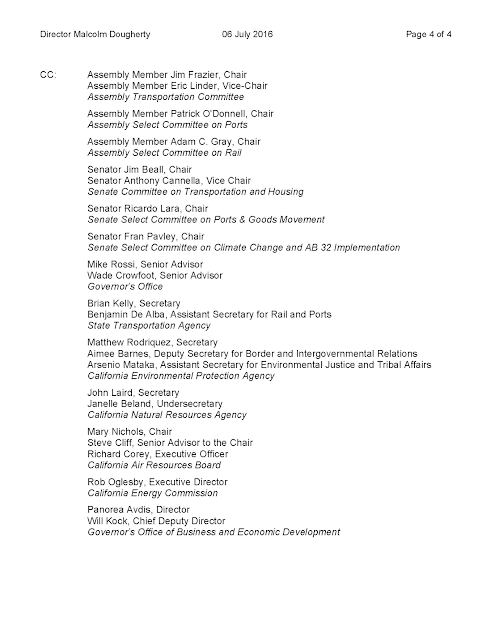 Again, as we stated in our draft plan comments, “Any system–transportation, freight, goods movement, etc.–is considered “sustainable” ONLY when its economic, environmental and social equity impacts are thoroughly considered, resulting in a positive balance and mutual benefits among all three elements.” Whether it is described as the three e’s, or the three p’s of “people, planet and profit,” sustainability can only be founded upon the examination of all three elements. 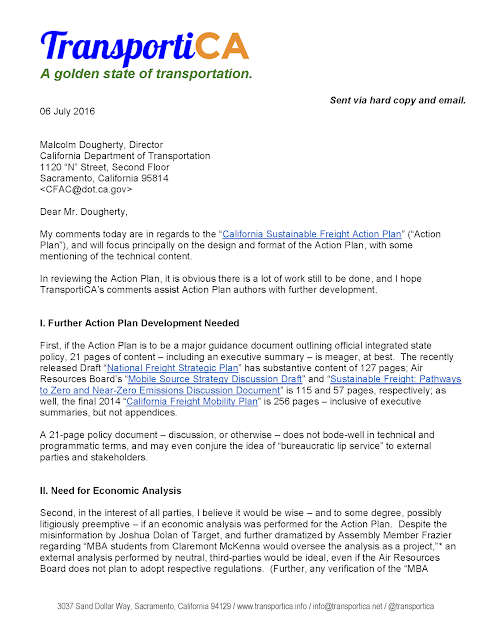 Unfortunately, as we see in the final plan, and especially in an entire chapter titled “Investing in California’s Freight Transport System,” authors of the final plan fall victim to the traditional bottom-line mentality, fulfilling economic considerations far above other less-tangible and less-quantifiable sustainability elements. As TransportiCA stated in follow-up communications, we believe the final plan would have been more appropriate to at least have three main chapters–one for each of the e’s of sustainability. Although environmental considerations are consistently mentioned–far less than financial perspectives, social equity is almost non-existent. This small mentioning of equity goes against the framework of the Triple-Bottom Line and sustainability. Social equity is the oft-forgotten element of sustainability, especially in the United States. When addressing prior, and even current sufferings associated with social-economic status, tied to ethnicity and biological construct, and furthered by the history of strategic in-opportunity, the business community may tread lightly on such consideration, or even completely ignore this examination, even though a proper sustainability determination requires such. We may not know why social equity is miniscule in the final plan, and we are certainly not going to speculate author’s intentions. However, when we do not thoroughly consider this element in our official policy documents, we are dishonest to our history, to those who have and will suffer from current unjust environmental and economic systems, and nonetheless, we still remain far from the ability to declare our system sustainable. History, public values, statutory mandates regarding environmental justice, freight stakeholders and the communities who bare witness to our economy’s undesirable externalities, require social equity be fully integrated in the final plan. Sustainability is a three-legged stool. Each element–economic, environmental and equity–serves a distinct, yet complimenting purpose. The seat is our definition / understanding of the elements and their integration with our larger system of freight. TransportiCA believes the current final California Sustainable Freight Action Plan has three uneven stools, and lacks a durable, well-structured seat. As always, your thoughts are more than welcome, and all California Sustainable Freight Action Plan interagency partners are provided the chance for full response. Below is TransportiCA's draft plan comments.